Bhutan’s population is little less than 700,000, with its annual growth of about 1.3%. The country’s population is quite young as its median age is calculated at 23 years. Reflecting the agrarian nature of the economy, more than 70% of the population lives in rural areas. They are mostly famers engaged in subsistence farming. The country’s population consists of three major ethic groups: Ngalong, Sharchop, and Nepalese. Ngalongs live in the western region, Sharchops in the east, and Nepalese in the south. Ngalongs and Sharchops are of Mongoloid stock and the Nepalese Aryans. Sharchops are believed to be the earliest inhabitants of Bhutan, although their origins are not known. The Nepalese are the economic immigrants who settled in the country in the late 19th and early 20th century and were later naturalized. The national language is Dzongkha. It is the mother tongue of the people living in the western region. There are 18 dialects spoken in Bhutan. And some of the vernacular languages are under imminent threat of extinction. Most Bhutanese who have been to school speak English as it is the medium of instruction. Since English is spoken widely it is considered one of Bhutan’s selling points. The people of Bhutan are friendly, warm, and hospitable. They invite complete strangers in their homes to share a meal or a cup of tea. They are curious and amiable, ready to exchange greetings and show the best of their country. 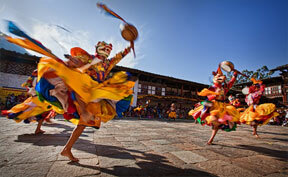 Bhutan is a land of rich mosaic of cultures, lifestyles, languages, and belief systems. In a country with a population of just over half a million, as many as 19 different dialects and a few languages are spoken. This is attributed to the fact that in the past Bhutanese communities settled in the valleys with limited communication. It is for the same reason that the sense of individuality and independence emerges as a strong characteristic of the people. The Bhutanese are, by nature, physically strong and fiercely independent with an open and ready sense of humor. The men wear Gho, a long robe tied around the waist by a fabric belt, or Kera. The main garment of women, Kira, is an ankle length wrap-around dress secured by a belt around the waist, and fastened at the shoulders with silver brooches called Koma. There is no rigid class system in Bhutan and social and educational opportunities are not affected by rank or birth. Bhutanese women enjoy equal rights with men. Both men and women are free to choose their partners for marriage and both can initiate a divorce. Bhutan’s traditional culture is alive in its performing arts, such as dance and music, which are an integral part of religious ceremonies. Traditional arts and crafts are still practiced as they were done hundreds of years ago. Bhutan’s textile tradition has, in recent years, gone international. The distinct technique, color, and style of indigenous Bhutanese weaving are being increasingly appreciated by textile specialists, collectors, and users from many parts of the world. Bhutan’s national language is Dzongkha. English is the medium of instruction in secular schools while Choekey (classical Dzongkha) is used in traditional and monastic schools.